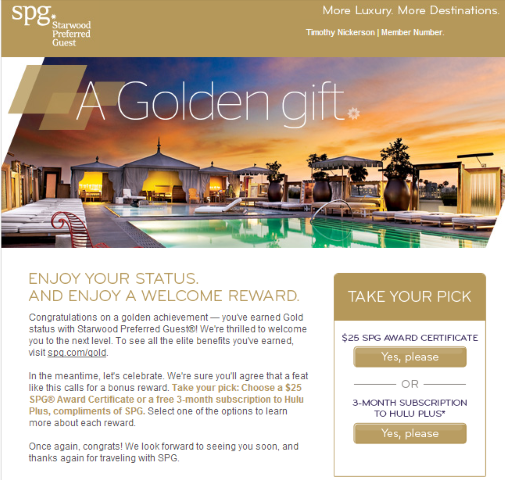 I recently earned Gold Status from Starwood (@SPG) – in December I had to hotel hop a bit to get this status too. You can see the full list of benefits offered to Gold Members here. I received an email from Starwood offering an additional gift. A Golden Gift for achieving Gold Status. The gift offered is a choice between a 3-month subscription to Hulu Plus or a $25 Starwood Award Certificate. Both items are valued at just about $25. I think I’ll take $25 Award Certificate in lieu of the Hulu Plus subscription. I’d prefer a cocktail or a snack on an upcoming stay, much more than 3-months of TV. What would you choose? I wonder what you get if you go from Gold to Platinum Status? A larger credit? A longer subscription to Hulu? Or something new all together? By Tim in Travel on January 19, 2013 .